Flash! 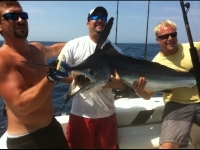 Fishing Discovered On East Coast of Mexico! Flash! Posted: Sun Mar 03, 2019 3:26 pm Post subject: Flash! Fishing Discovered On East Coast of Mexico! Flash! Hello Everybody! My name is Richard. I am a Viet Nam Marine Veteran, who somehow or another, has managed to find himself in the enviable position of owning and operating a fishing charter business in Playa del Carmen, MX. I guess I am here because I love fishing.